In this article we will focus on the most interesting and innovative compartment of the whole KR3 project: the engine and the ensemble of secondary parts which permits to achieve the best possible power output. 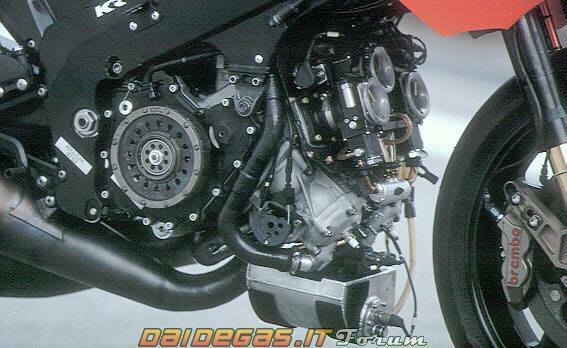 We underlined in the past episodes that the engineers designed the Modenas KR3 in order to make the bike as agile as possible, and the consequences of this choice on the engine layout: have one cylinder less than the competitors meant lower reachable revs, which is the easier way to get power. So the KR Team focused all the efforts on the improvement of the volumetric efficiency, of the combustion and on the reduction of the mechanical losses. The engine, designed under the supervision of Bud Aksland, father of the Modenas-KR team manager Chuck, was a 2-stroke, V3 of 498cc with “squared” bore-stroke ratio (59,6mm x 59,6mm), and the angle between the cylinder banks near to 180°, far wider than older triple GP engines like Honda NS and DKW. In the first version of the engine, there were two lower cylinders and an upper one, with two counter-rotating crankshafts (this arrangement would have been reversed in the following season): this choice, theorically, provides a good balancing of the inertia forces, so the engine was designed without a counterbalancing shaft but unlucky, during the 1997 season, there were many mechanical failures, expecially crankshaft spreadings. The problem was the unique crankshaft layout of the KR3 engine: in order to improve the volumetric efficiency, the lower cylinders featured a shared crankcase, likewise the MuZ-Weber Swissauto engine, but this meant that between the two con-rods there was only an unsupported flywheel disc. It was spared one crankcase bearing, but the crankshaft was also much more flexible and the need to have both the pistons of the bank reaching the bottom dead centre (BDC) together forced to use staggered pins, that led to an unconventional firing sequence and unpredictable vibrations. The engineers will solve the problem in the 1998, coming back to a more conventional layout. 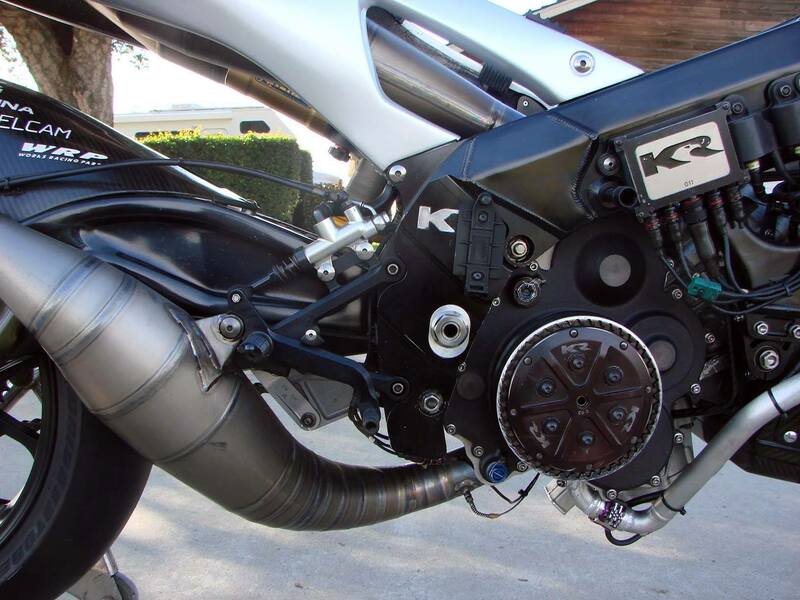 The feeding system was the masterpiece of the bike: the KR Team dared to replace the conventional carburetors, like Honda in 1992, with a unique and totally self-developed solution. The KR3 adopted electronic carburetors, without floating bowl: there was a pressurized duct which provided the fuel to the air flow, in a way closely similar to a fuel injection. The result was a better control of the air-fuel ratio, and a system that didn’t suffer the emulsification of the fuel due to the vibrations. Reed valves controlled the flow in the crankcase. The transmission compartment featured a dry clutch and a 6-speed gearbox. The exhaust system was developed and tuned in partnership with the Italian manufacturer Arrows. 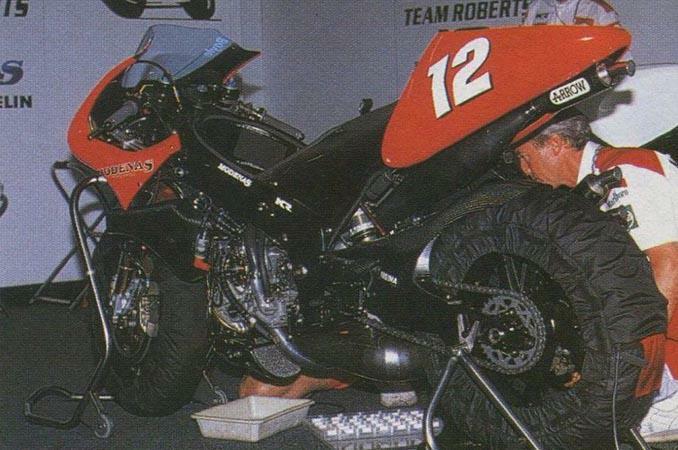 When the Modenas KR3 made its debut in 1997, the power output was about 160BHP. The engine operating temperature was kept under control by a ducted, under-seat radiator: instead of putting it behind the front wheel, the engineers developed a solution inspired by Formula 1 cars, in which the radiator is put in the middle of a duct that is convergent in the first section, to accelerate the air, and then divergent. In this way was possible to obtain a far more efficient cooling system, with a smaller and lighter radiator and also a strong reduction of the aerodynamic drag. The engine gradually improved its performances and in 2002 reached 180BHP @ 12’200rpm, with conventional Keihin carburetors, a counterbalancing shaft and exhausts by Micron.